02. Cane & Able - Who's Gonna Take The Weight? For our fourth installment, we've chosen a band best known for their tame early 80s repertoire. Mention the song "Celebration" and your geriatricgrandmother would know you were referring to Kool & The Gang's biggest hit. But even though we at Le Smoke Disque have nothing but love for the band's late 70s and early 80s producer, Brazilian jazz legend Eumir Deodato, we want to show you the influence Robert "Kool" Bell and his compatriots had on the world when they burst on the scene in 1969 with their self titled debut. Though James Brown's JBs certainly stood out as a funky take on the big-band ensemble popularized in the swinging 1940s, Kool & The Gang took the form to its greatest heights. In doing so, they not only influenced American bands such as Tower of Power, Chicago and Blood, Sweat and Tears, but fledgling funk outfits the world over. We could have shown the band's influence on the mainstream by compiling the multitude of tributes paid by jazz greats such as Melvin Sparks andGrant Green. But we like to dig deeper than that. We start in Central and South America, where the band's eponymous hit single could have provided enough fodder for a compilation in its own right. We've decided only to include two versions here: "Los Pelos Tiesos" by Mexican funk-monsters Rabbits and Carrots and Brazilian trombonist Ed Maciel's 90-MPH burner. And, as a counterpoint to the assumption that by the late 70s, only The Gang's smooth sound hit the foreign shores, we offer up Tyree Glenn, Jr. and his post-punk outfit Brain Damage funking "Kool & The Gang" live in Germany in 1979. "Give It Up," a lesser known single from the band's first album, finds two offerings here. Thailand's The Impossibles offer a heady version fortified by fine drum breaks on the only album the band released abroad (in Sweden, of all places!). Akron, Ohio's Jessie McDaniel double-times the tune on one of his too-rare 7"s released on the small Top-Hit label. Perhaps at some point in the future, we'll revisit Kool & The Gang and examine their mid-70s oeuvre. Their sublime synth-anthem "Summer Madness" alone makes the search for covers of that era's classics worthwhile. But for now we re content to bask in the warmth of The Gang's golden era, to ponder "Funky" George's steady syncopation, to catch an earful of tough brass and Kool's funky bass. 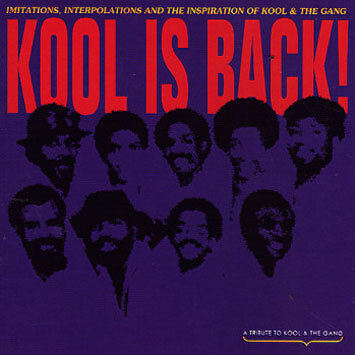 Yes, for the moment, Kool Is Back!, again.